For today's Makeover Monday I am going to show you the last wall of our living room. You should have a good idea of how the Living Room looks all around now. On this wall we have a bay window that I absolutely love! When Erik and I were looking at houses a bay window wasn't a must but I always loved the houses that had bay windows more than the houses that didn't. We have our staple gray paint carrying over to the wall with the bay window. Covering the bay window we have some light gray drapes hung from black curtain rods. We kept the curtain rods straight and square to match the coffee table and shelf shape. In front of the bay window we have two arm chairs. 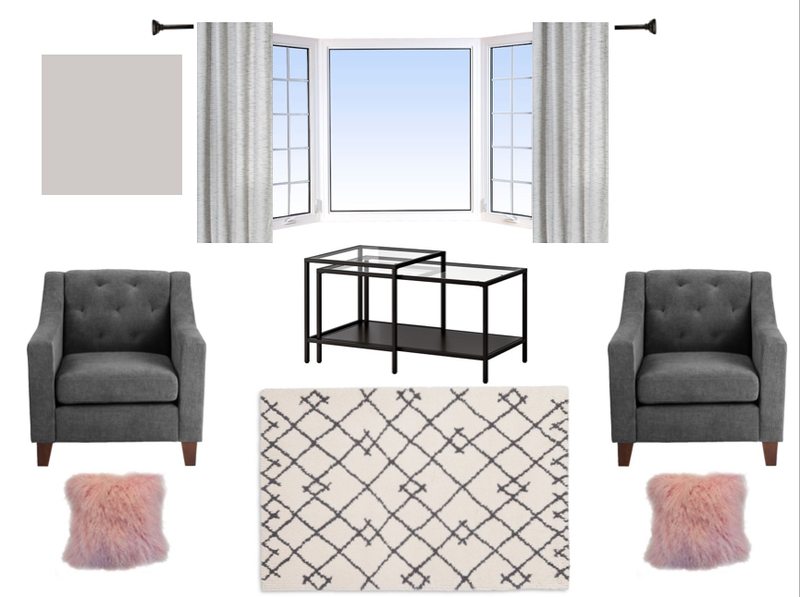 I really wanted to get some pink arm chairs to add in a pop of color to this side of the room. I couldn't convince Erik so we went with the arm chairs that matched the couch and added some pink pillows instead. On the floor we have a white shag rug with a gray design to tie it into the rest of the room. On top of the rug we have a nesting table from Ikea. 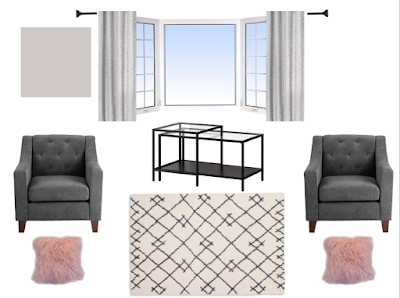 We plan to place the smaller square table in between the arm chairs and keep the long narrow table on the rug as a coffee table. I love the overall feel of this room. It feels fancy but not too fancy. Where is your favorite place to shop for furniture?